This retiree had a few hours this morning before she snapped into action in the outside world. So I took my cup of coffee to the Goddess in my backyard. Although I have researched, I have never found who She is. Janice and I bought her in Kentucky (of all places!) on our way home from Red River Gorge back in the ’90’s. Over the decades, she has shrunk–no, not osteoporosis but her body broke off from her base so she lost twelve inches. Short like me. And for a time it seemed that many of my goddess statues, mostly small ones, lost their heads. I took it as a clear sign to ‘get out of my head’ and not overthink so much. 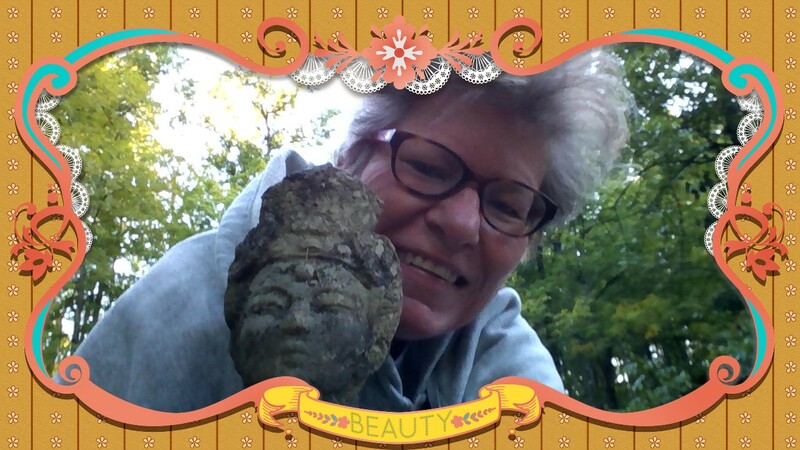 So my Backyard Goddess lost her head in a move one time and got super-glued back together. One inspired time I added a glittery necklace and it now (mostly) hides the damage as it decorates. I leave a plastic yard chair out there in front of Her and the circle of rocks. Symbolic. Not used often. But this morning, with the air crisp as autumn and this mortal rising earlier than usual, I sat in the chair. Of course, She is right about all these as goddesses tend to be. But as I returned to the house and my schedule noted on my calendar, I remembered that I’m a goddess, too. A fulfilling morning at the Siddha Yoga Meditation Center here in Cincinnati. After chanting and meditation, we discussed community issues over amrit (a meal). phebek108 on A return to India! Tamsin McPherson on A return to India!